Since 1992, we’ve scoured California in search of our state’s last heritage vineyards on a mission to offer flavors and stories unlike any remaining in the world. By partnering with multigenerational, seasoned growers, we are able to capture the unique character and power of old vine fruit and craft wines with soul and purpose. Online Only. Additional savings do not apply. You only need to spend about 5 minutes at the kitchen table with Jim and his mother, Jeanne, to understand what “salt of the earth” truly means. But don’t let that fool you. Jim has more knowledge about growing grapes in the cuff of his jeans than most would attain in a lifetime. Which is why Frediani grapes will continue to be the cornerstone of T-Vine wines for a long, long time. A near perfect reflection of the Frediani Vineyard fruit, our 2016 Petite Sirah brings together everything you love about this varietal. You will find deep aromas of serious blueberry, dusty backroads, and cocoa nibs. Rich fruit flavors and grippy tannins cover every inch of your palate with effortlessly integrated complexity. With great structure and a longer finish than the '15, you'll find this wine to be one of your new favorites. If you could drink the color purple, this would be it. You should see this vineyard. It's absurd. Picture a half-acre of dried-up river bed, scattered with randomly-planted, barely-tamed grape vines. We're not exactly sure what all is in there, but it's always fun to guess. There's some Zin, some Petite Sirah, some old Carignane and probably Malvasia Nera. The rest, we're unable to identify. Though it may look like a messy rock jumble, in actuality, this Oakville vineyard is a museum of pre-prohibition cuttings, masterfully curated by one Alex Vyborny. With the 2016 vintage, the intense, ripe flavors of black currant crumble, cinnamon, and juicy brambles elicit visions of diving into a basket of freshly picked berries while lounging on the front porch on a perfect summer day. Dark fruit flavors burst from the glass while zesty spices are perfectly layered across the finish. 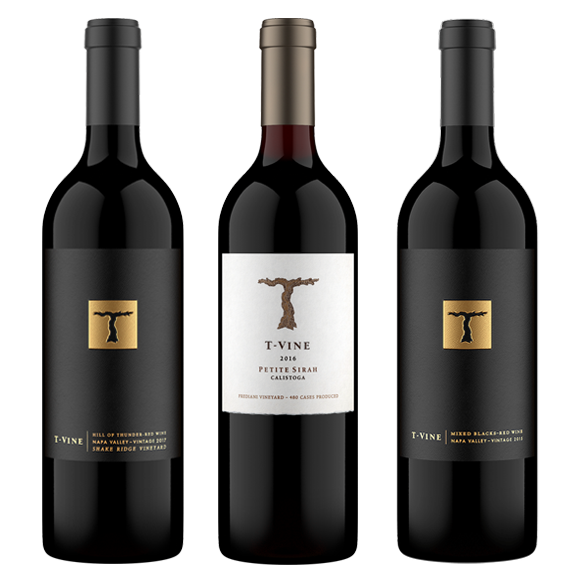 The brightness of the Zinfandel is supported by the deep Petite Sirah tannins, creating a perfectly bold structure with layers upon layers of complexity. Everything about this wine is utterly superb.